Class 10 is the most crucial phase wherein students enter into another phase of their education. Class 10 is very important phase of education. Currently, the CBSE Class 10 Board exams is about to begin in the month of March. It is high time for students to prepare more and more for the upcoming examination. To help with your preparation, there are vast number of books available. Students might get confused in choosing the right book. Apart from textbooks, it is important to prepare using sample question papers. Oswaal CBSE Sample Question Papers are one of the topmost publication offering the latest question papers for students. Oswaal offers varieties of questions picked up from all previous year question papers. They have compiled all important questions for students to improve their board examination preparation. Kopykitab is offering latest Oswaal CBSE Sample Question Papers for students that will help students to score 100% marks in the upcoming CBSE Board exams. During the last minute of examination i.e., at least 20 days before the examination take up tests and check your ability on the subject. Assess yourself on how strong you are in attempting all questions. Give time for each sample question paper and try attempting all questions. 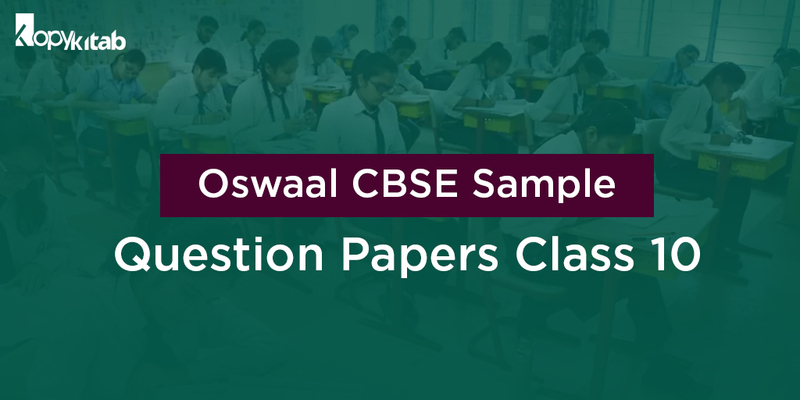 Oswaal CBSE Sample Question Papers include all the subjects with latest and important questions. Instead of going to shops for buying sample question papers, you can download the PDF format of question papers. Kopykitab is offering Oswaal Class 10 CBSE Sample Question Papers in PDF format which will help students in practicing more whenever they wish to. You can download these PDF format question papers to your smartphones, tablets, or laptops and start preparing for exams. You can buy Oswaal CBSE Sample Question Papers PDF from our site with great offers and deals or you can download the PDF from the below table. We have provided links for each subject Sample question paper. Prepare well for the upcoming CBSE Board Exams using a wide range of preparation books available in our site. We are offering you sample question papers which include questions compiled from previous 10 years board exam question papers. You can get exposure to all types of questions by answering these questions. Apart from exercise questions, CBSE follows NCERT syllabus. So, if students are well versed with examples in NCERT books at the end of each chapter, then students can easily score 100% in their board exams. One should be dedicated towards examination preparation to boost their score in exams. CBSE Class 10 Board exams are starting from March 7, 2019. Candidates can refer our blog on Tips from Toppers to score 100% marks in CBSE Board Exam to increase their board exam scores. We have composed important tips from toppers on how to score more, how to study during last minute of exams, important tips during exam preparation. Hope you have started your CBSE Board Exam preparation. For all latest book from various publication, updated news on CBSE Board exams stay tuned to our site.